One of my favorite places to eat in NYC is the Scandinavia House, which is a kind of cultural center for all things, well, Scandinavian. They screen movies, hold art exhibitions, put on concerts, and whip up a mean herring sampler in the restaurant. In fact, I've never had anything but the herring sampler there, because I can't tear myself away. It's always served with little triangles of lefse and a dollop of cold potato salad in the center. So when we decided on herring for our appetizer, I knew both lefse and potato salad were soon to follow. This is an incredibly simple preparation, from my copy of the Haugesund Husmorskoles Kokebok. It forgoes all the sour cream in favor of the cleaner flavor of vinegar and pepper. As a result, it's the perfect sidekick for a creamy herring, which, let's face it, is the true star of the show. Slice the potatoes into about 1/4" slices. Set aside. In a small bowl, mix the vinegar, water, pepper and sugar. In a serving dish, place some of the potato slices in a single layer on the bottom, then sprinkle with some of the chopped onion. Spoon some of the vinegar mixture over the top, then sprinkle in some parsley. Add another layer of potatoes, followed by more onion, vinegar mixture and another sprinkle of parsley. 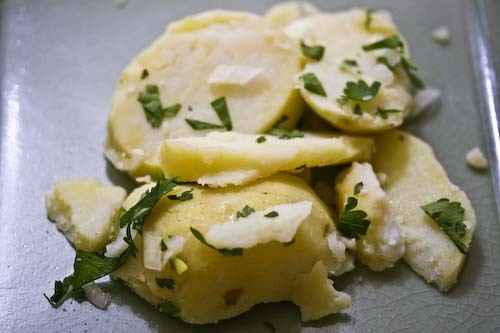 Continue until you have used all of the potatoes, and end with a sprinkle of onion, the vinegar mixture and parsley. 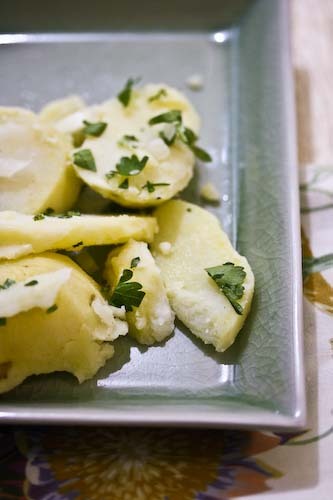 Refrigerate for several hours or overnight so the potatoes can absorb the vinegar. Serve with lefse and herring salad. This looks beautiful! I love potato salad. You take amazing photographs.